Police, an internationally renowned brand, has become over the years a “lifestyle brand” due to its interpretation of a cool, rebel, transgressive, and strong image. With its metropolitan style, Police has its name on an extensive selection of accessories: glasses, perfumes, timepieces, custom jewellery, and leather goods. 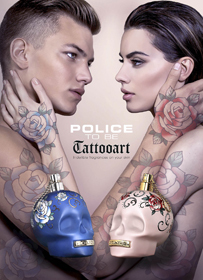 Police fragrances represent a meeting point between the present and the future, and they communicate in every aspect the rebellious soul of the brand. Police fragrances are made for the person who wants to be distinctly different.